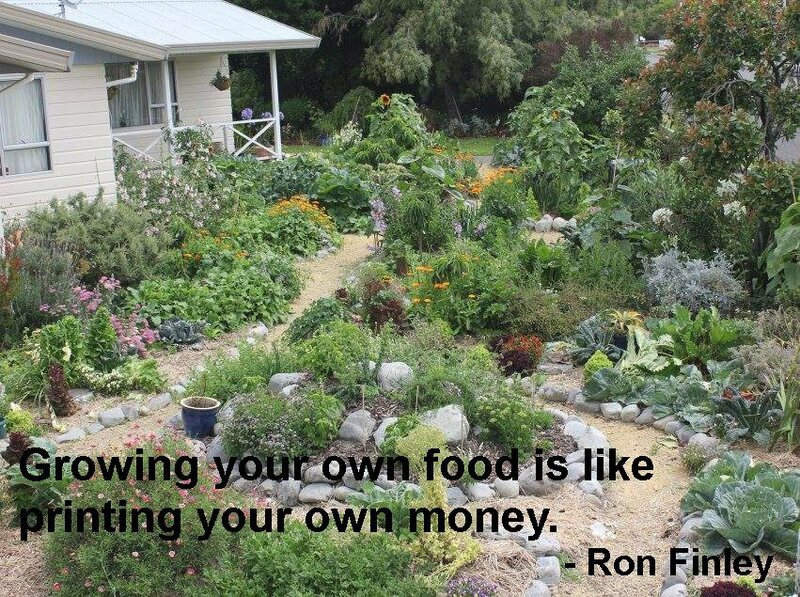 As I recall it, growing food was the norm where I came from. My grandparents had always gardened, and so did my parents. Our food all came from the garden near our back door. In addition there were fruit trees and berry bushes, peaches, apples, lemons, nectarines, black currants and raspberries. I don’t ever remember a day we went hungry. And during summer my father salted beans, bottled tomatoes by the ton it seemed and preserved peaches and apples for use over the winter months. He also made sauerkraut in an old stoneware mason jar and large preserving pans of pickle, relish and jam. As also did most of our neighbours, with much surplus produce being swapped over the back fence. My father came from a large family where it seems they all, not just the girls, learned to cook, not standard for their era. Vanessa, a blogger from Taihape turned her parents front garden into a food space, pictured above, especially to show folks where food comes from … not necessarily the supermarket. Check out her blog HERE. Note: for latest updates on gardening and Wally Richards’ articles scroll to the bottom. Additionally find related articles by using the ‘categories’ box on the left of the page, the tag cloud to the right or the search box, top right. …And this will inspire you no end, talk about transforming a community! How to build a no-dig garden … no kidding! "we are not daunted by sophisticated arguments that say, 'these small actions are meaningless in the face of tomorrow's problems', because I have seen the power of small actions and it is awesome!" "....they [people] know it's time to take personal responsibility and invest in more kindness, to each other, and to the environment.."
Changing The World … Garden by Garden!